A dapper young African American man stares out from the cover of Lambchop’s new album, Mr. M, his top hat stylishly askew and his face faintly quizzical, as if he expects great fortune to befall him at any moment. He’s a curious fellow, and even though he doesn’t figure directly into these eleven new songs, he presides over them benevolently and even a bit mysteriously. While composing songs for Mr. M, Wagner painted a full series of these young society men, although he stresses that there’s no real connection between the portraits and the lyrics, which chronicle the usual Lambchop concerns: loneliness, romantic and spiritual bafflement, cooking, Christmas lights, country music, and various strains of assholery. “The songs aren’t stories about these people or anything like that,” he says. “The only real true connection is just by virtue of them coming about at the same time. Sometimes I would go in and work on painting, and then I would start sneaking songwriting into my studio time. I started to think that it would be neat to pair these images with the songs, maybe present this particular work with the music.” In certain ways, Mr. M is an experiment in synthesizing art and music, a combination that Wagner admits mystifies him. Still, music beckoned. 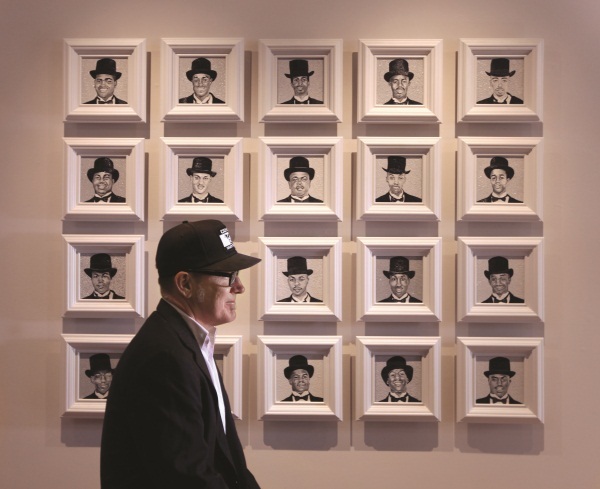 Wagner co-founded Lambchop in 1993, originally as a low-stakes project among friends. Many, many friends, in fact. Membership ballooned into double digits, as if everyone in Nashville who could play a fiddle, horn, guitar, or tambourine belonged to the band. As the group toured and built audiences in America and Europe, and as their explorations of Nashville history grew more intricate and idiosyncratic, Wagner continued to balance the band with his own solo painting. One of his early works ended up on the cover of Lambchop’s 1994 debut, I Hope You’re Sitting Down. For years, however, those two pursuits ran in parallel, rarely intersecting. “I’d always shied away from the idea of trying to incorporate these two parts of what I do into single works,” he says. “I thought it was interesting, but I just never felt like the art world and the music world got along.” After releasing the career-making Nixon in 2000, Wagner found himself too busy touring and recording to devote much time to painting, so he set aside his canvases and paint tubes to concentrate on the band. Still, the visual remained a vital component of Lambchop’s music: Wayne White’s fantastical text paintings adorned the covers of Nixon in 2000 and both Aw C’mon and No You C’mon in 2004. Michael Peed’s painting-within-a-painting offered a visual explication on 2008’s OH (Ohio), drawing out themes of private connection and public disconnection.